You guys! These Salted Caramel Chocolate Tarts are so good! I got the idea to make them when I saw this recipe the other day. While it looks fantastic, it uses some ingredients that are not whole foods. So I decided to re-make this recipe, but with whole food ingredients. Before I share my recipe, let me be clear that these are very rich. I used 4 inch tart shells and got 4 out of the recipe. You can probably use a large tart shell too. These Salted Caramel Chocolate Tarts are vegan, gluten free and grain free! If you like things with salted caramel, you may also like my Flourless Salted Caramel Chocolate Chip Cookies. These delicious chocolate tarts would make a great holiday dessert. They fit almost any diet. They are gluten free, vegan and grain free. If you needed a nut free option, you could make the crust out of sunflower seeds and use Enjoy Life chocolate chips. If you don’t want to use chocolate chips, you can use the 3 ingredient chocolate recipe in this video. If you go that route, these need to be stored in the freezer though. For more videos, you can subscribe to my You Tube Channel. A whole food version of this classic dessert! In a food processor , grind up the pecans for a minute. Be careful not to over process them and turn them into pecan butter. Add the dates and pulse a few more times until everything looks like it's starting to clump together. Grease your tart shells with a little coconut oil. Press the pecan/date mixture into each tart shell . Place them in the fridge. Cook the vegan sweetened condensed milk down even further so it resembles a caramel. Stir in the sea salt. Pour the mixture into each tart shell and place them back in the fridge. To make the chocolate, use a double boiler to gently melt the chocolate and the milk together. Once it's smooth, pour it onto the top of the caramel in the tart shells. You can also add a little more coarse ground salt to the top of the chocolate for garnish if you like. Place the tarts back in the fridge. They should be ready to eat in about 20 minutes. You can make this dessert in advance. I think up to 2 days before you serve it. These should last about 10 days in the fridge. Enjoy! WOW! These look like heaven! Holy cow, these are right up my allie!! I can't wait to make these. Yummy! Thanks! They are soooo yummy! Thanks Melissa! I think maybe 1 cup chocolate chips? Would almonds or peanuts work for the crust instead of pecans? Multiple nut allergies in our house leave almonds, peanuts, and coconut as our safes. These look sooo yummy! Thanks Shelley and thanks for pinning! I made these yesterday in a muffin tin...making 8 tarts. Followed the directions exactly but I froze mine instead. I just had one straight from the freezer and it was incredible!! Thank you so much for this wonderful recipe! Yay!!! Thanks for letting me know they freeze well. These look amazing! While I always appreciate that you put how long your recipes will last in the fridge, it's not necessary with my family. Whatever recipe I use, they finish it off right away :) Thank you! Well, I just made these. I had a feeling that I did not have enough chocolate but took a chance anyway. I used chocolate chips. About six ounces, compared to your 3.5 ozs chocolate bar. I cooled the caramel for a few minutes then tried to put the chocolate on and got lots of drips. not only did the caramel not set, but the chocolate did not cover it. I am sure it is wonderful tasting as I have been taking tastes all along. It just does not bare any resemblance to yours, sadly. I'm sorry it does not look the same. :( The caramel in this never truly sets. It's supposed to be gooey. If you want something a little more firm, you can try adding a little cornstarch or arrowroot to it. I am not so concerned about the caramel. how did I run out of chocolate? Your picture has a nice thick layer of chocolate...mine has dollops. Either way, it will taste amazing. Just curious. Maybe because you used chocolate chips and I used a bar? Glad they taste okay though. Maybe double the chocolate next time? They might work in muffin cups. They also may work in a pie dish, but keep in mind they are gooey, so when you cut slices, they may not look pretty. Oh yum! That runny caramel looks so good. 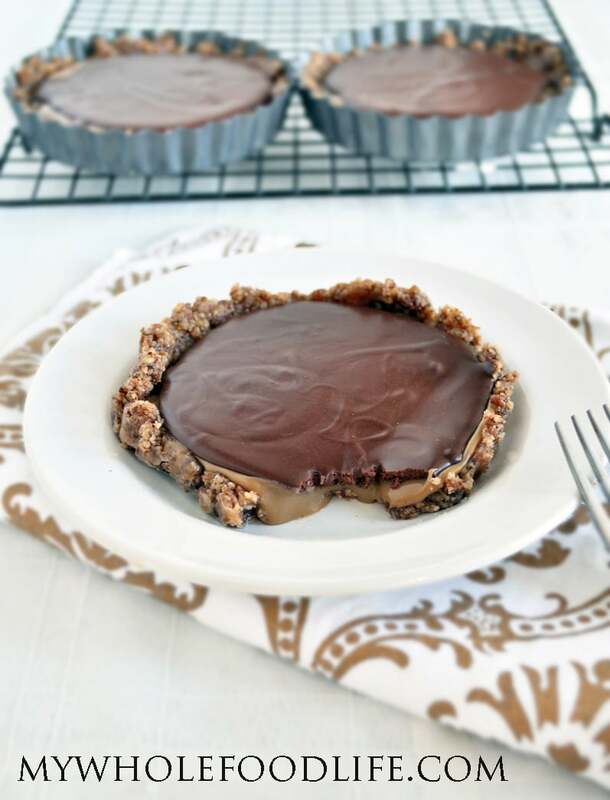 I love a little salt with both chocolate and caramel so I'm sure I'd love these tarts. Thanks Emma! They are really good and also dangerous haha! How much condensed milk if someone isn't making it?? Thanks! They look incredible. I didn't know that you can make vegan sweetened condensed milk at home! What a wonderful idea. Can I use honey instead of coconut sugar to make it? Can you use something other than dates? Hi Melissa, I just made these delicious little tarts and they are so yummy! I don't digest coconut easily so I made my sweetened condensed "milk" from powdered soy milk. My tarts turned out fantastically thick and rich with just the right amount of sweetness and crunch. I am in the process of transitioning to a vegan whole foods diet. I love your website and recipes! I don't do white sugar, wheat flour, and dairy well, so your recipes are ideal! Thank you for your beautiful contributions to healthy living! I asked for both of your cookbooks for Christmas!